Are you looking to increase visitor engagement on your website? Then you’ll need to focus on an important metric called bounce rate. In this article, we’ll take a look at what “bounce rate” means and how to find your bounce rate in Google Analytics. 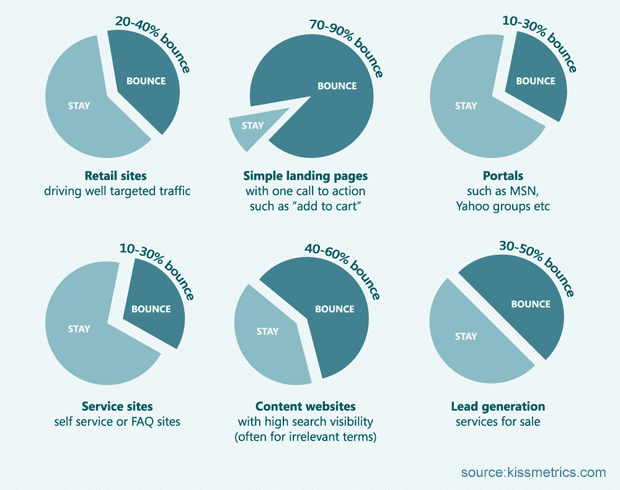 Bounce rate is the percentage of visitors who leave your site after just viewing one page. Bounce rate of a page = Total number of bounces on a page / Total number of entrances on the page. Now you might be wondering, what’s an ideal bounce rate? The short answer is: It depends. A high bounce rate may make sense depending on your goals for that page. But, in general, the lower your bounce rate, the better. That being said, let’s check out how to find your website’s bounce rate in Google Analytics. The most simple way to view your website’s bounce rate is by using the MonsterInsights plugin. It lets you view your site’s bounce rate, as well as other important data directly on your WordPress dashboard. If your website was built with WordPress, using Google Analytics is super easy with MonsterInsights. It’s the most user-friendly Google Analytics plugin and lets you set up and use Google Analytics in WordPress easily. Best of all, it allows you to view all of your most important Google Analytics reports right on your WordPress dashboard. That’s right; you can find your website’s bounce rate, as well as other important metrics, right in your WordPress admin panel. With MonsterInsights, you don’t need to navigate away from your site to view your Google Analytics reports. It’s very incredibly convenient and easy-to-use. 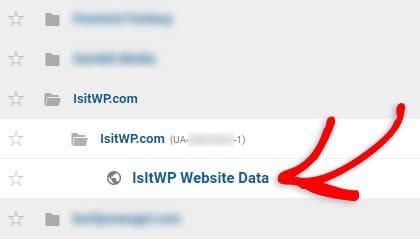 First, you can view your bounce rate right in your WordPress admin page (www.yoursite.com/wp-admin) via the MonsterInsights dashboard widget. The dashboard widget shows a quick summary of your website’s data which also includes your bounce rate. With the Google Analytics dashboard widget, you can choose to view your Analytics data for the last 7 days or 30 days simply by clicking the cursor at the top of the report. Next, you can see this report in your MonsterInsights reports page as well. Navigate to Insights » Reports from your WordPress dashboard. Then, in the Overview report, you’ll see your site’s bounce rate. Want to view the bounce rate for your individual posts and pages? Go to Insights » Reports and click the Publishers tab. Then, you’ll see the bounce rate for your top landing pages. As you can see above, you can view your posts and pages’ bounce rate along with users’ average duration on the page. You can better analyze user engagement on your site by studying these 2 metrics together. 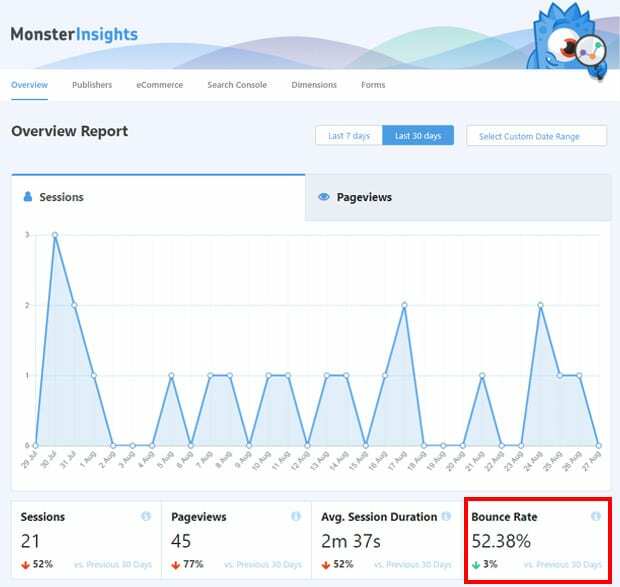 If you aren’t using MonsterInsights, you’ll have to open the Google Analytics website and log into your profile to view your site’s bounce rate. In the next section, we’ll show you how to find your bounce rate on Google Analytics’ platform. If you want to view your website’s bounce rate on Google Analytics’ platform, you can follow the steps below. 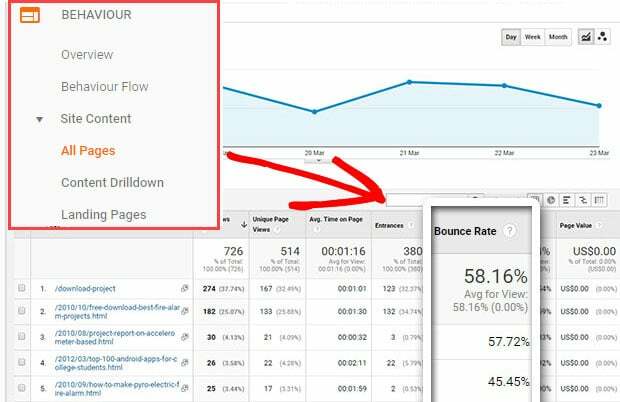 Sign into your Google Analytics account and select the website for which you’d like to see the bounce rate. You’ll see the Audience Overview page. To view the bounce rate of the entire site, click on the metric Bounce Rate, which you’ll see alongside many other metrics. 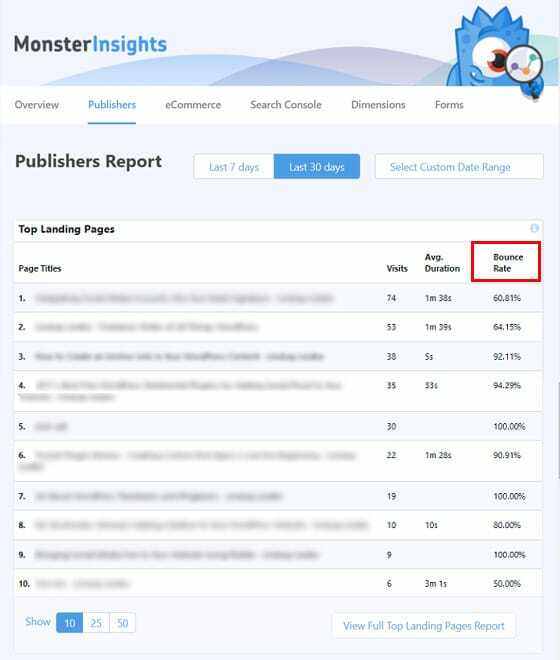 To view the bounce rate of individual pages, navigate to Behavior » All Pages. In the table, you’ll see the Bounce Rate column. If you want to see the bounce rate for a different time period, feel free to change the date range from the top right-hand corner. We hope this article helped you find your bounce rate in Google Analytics. If you’re looking to increase user engagement on your site and reduce the bounce rate, you’ll need to read this guide on how to reduce bounce rate and boost conversions.